Hhere is the second block for the quilt. 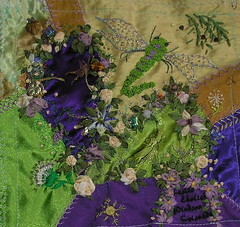 LOTS of sre, some beading, dimensional embroidery and stitch variations. This block is symbolic of life bursting forth on sparkling wings from a "broken" heart flying joyously to health and happiness! Hi everyone!!! Goodness, I didn't realize it had been so long since I posted! 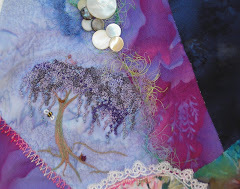 I've been busy stitching and changing email addies and, and, and! This is the first of two blocks that I did for the Art Bra Quilt project. The quilt itself will be hung in a cancer center in tribute to women and breast cancer. The theme this year was hearts and the colors were to be purple (primary) and jewel tones or victorian tones. Purple is NOT one I work with a lot so this is definately a challenge for me! :_) This particular block is a healing block. I have stitched lemon citrine and aquamarine into it along with a lot of other beads (of course)!!! 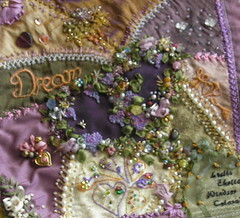 On the left side I embroidered "dream", on the right side "hope" and at the bottom "life". All the blocks were to have our name and city/state or country in the bottom right corner. I have lots of stitch combos on here.... a tribute to TAST (www.inaminuteago.com) along with silk ribbon embroidery,dimensional embroidery, lace embellishment... hmmm....did I leave anything out? LOL!!! At any rate...enjoy!! !